“I think mice are rather nice.” So began the children’s poem by Rose Amy Fyleman that I read to my three sons when they were young. Fyleman was an English writer who lived in earlier times (1877-1957) and her mice were not the primary hosts for the larvae and nymphs of black-legged (Lyme disease) ticks or the possible carriers of hantavirus. Unfortunately, our winsome, large-eyed, big-eared white-footed mice are. They can be covered with the larvae and nymphs of black-legged ticks and build up huge concentrations of the Lyme disease bacteria Borrelia burgdorferi, which doesn’t sicken them, and thus remain the principal reservoir for the disease. They also enjoy life in our old farmhouse, and we are compelled to keep traps laced with peanut butter especially in early autumn when they are seeking warm winter homes. Live-trapping and moving them are not an option even if we wanted to. The late, great mammalogist William J. Hamilton, Jr. once live-trapped and marked white-footed mice and released them a mile away from their home territory. A few days later they were back, exhibiting an amazing homing ability. In addition, they know their home ranges of approximately one-fifth of an acre so well that they can quickly find hiding places whenever they are needed. But as Hamilton once wrote about the white-footed mouse, “It often takes up residence in houses; the first evidence of its presence may be a boot half filled with cherry pits or hickory nuts.” In our house, I find sunflower seed stashes not only in old boots but stuffed under the cushions of our sofas and chairs. And occasionally I’ve uncovered shredded sweaters or shirts balled up into nests on some forgotten closet shelf or in an old bureau drawer. However, most white-footed mice find homes outdoors in abandoned squirrel, woodchuck, or bird nests, bird nest boxes, tree cavities, half-rotten stumps, rock piles or even in a ball of leaves underground. Recently, researchers have noted that they especially like the humid conditions under the rapidly expanding invasive shrub Japanese barberry, which is also favored by black-legged ticks, still another connection with Lyme disease and white-footed mice. White-footed mice use their long tails as props and balancing organs, to climb trees, although they are not as adept as their longer tailed congener’s deer mice. White-footed mice (Peromyscus leucopus) and woodland deer mice (P. maniculatus) look alike, and often live in the same habitat in our Appalachian forests. The length of their tails can sometimes be their distinguishing characteristic because the tails of white-footed mice are slightly less than half the total length of their bodies while the eastern woodland deer mice have tails more than half their total length. But the best way to tell them apart is by comparing their skulls. Since I’m not inclined to measure their tails or study their skulls, perhaps some of the mice in our home are deer mice because they too can create havoc inside homes and camps and are carriers of hantavirus, although so far they’ve not been indicted as primary hosts for black-legged ticks. 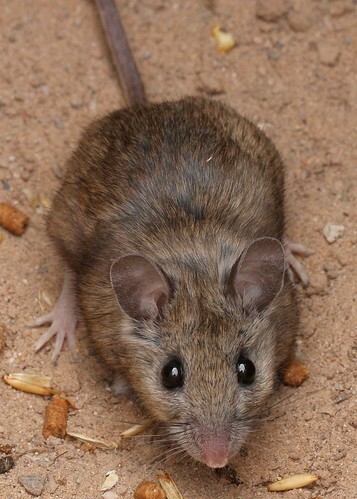 Both species of mice are abundant over a wide range of North America, but white-footed mice have drastically increased their distribution over the last few decades and now are found in the eastern two-thirds of the United States except for Florida, as far west as portions of Wyoming, Colorado, and eastern Arizona, south through eastern Central America and north in Ontario, Quebec, southern Nova Scotia, and even Labrador. Back in the 1980s, J.O. 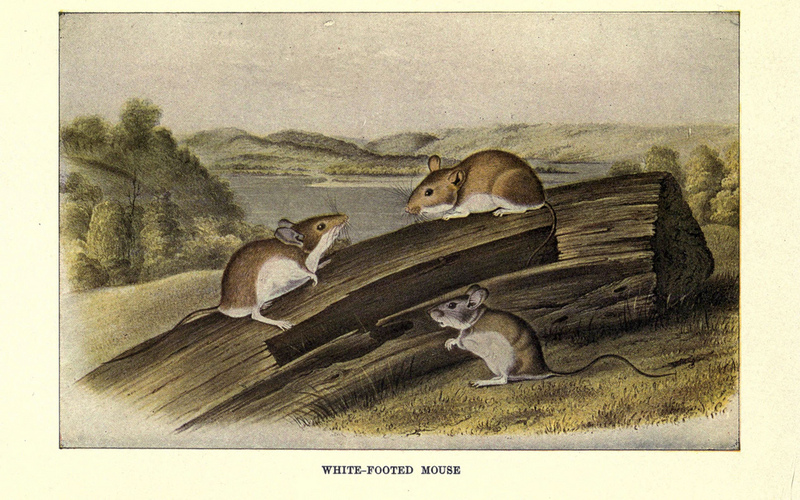 Wolff did extensive studies of both white-footed mice and deer mice in the Appalachians of southern Virginia and found that female white-footed mice lived in separate home ranges while males had ranges overlapping one or more females with which they mated. It seems as if white-footed mice are usually polygamous, but can also be monogamous, and even in at least one known case polyandrous. These choices may protect their mothers and their young because males can recognize their mates and children and will not kill them. They even often help raise their offspring, although females do most of the work. Mating begins in early March and continues through late October in Pennsylvania. Their gestation period is usually 23 days unless a female is still nursing a previous litter. Then gestation can be anywhere from five to 14 more days. Most litters contain four or five young but can be from two to eight. Born tiny and naked, they develop rapidly, and at three weeks of age they are able to leave their nest, although if they are threatened they can leave at 16 days. Previously, if their mother is disturbed while nursing, she runs from the nest with her young clinging to her teats and sometimes falling off as she heads for the nearest hiding place. These young can breed as early as 46 days of age, but most are two months or 60 days old before they do. Still, it is easy to see how many would survive if they did not have many predators such as skunks, mink, weasels, raccoons, foxes, coyotes, bobcats, black bears, and black rat snakes. These “most abundant and ubiquitous rodents in Pennsylvania,” according to mammalogist Joseph F. Merritt, also have catholic food tastes, eating whatever fruits, seeds, and small creatures are available. A short list includes various grass seeds, raspberry seeds, shadberries, the fruits of viburnum species, hickory nuts, basswood seeds, and conifer seeds, and in the summer they add meat to their diets in the form of caterpillars, ground beetles, snails, centipedes, occasional small birds, and even other small mammals including young white-footed mice. But their favorite foods appear to be pitted wild black cherry seeds, acorns, and the seeds of jewelweed. The latter taste like walnuts and have turquoise-blue endosperms that turn their stomach contents turquoise-colored in late summer. On a study of the impact of small mammals on northern red oak regeneration by Colleen A. DeLong and Richard H.Yahner from October 1989 until December 1990 in Huntingdon County, Pennsylvania, they attributed most red oak acorn loss to white-footed mice from 67% to 88% in autumn and 94% to 100% in spring in a section of mature forest where they had planted 400 red oak acorns. Certainly, we’ve had fewer mice in our traps lately, and it may be because we haven’t had a good acorn crop in three years. In fact, many wild fruit and nut crops were sparse or nonexistent in 2013, including wild black cherries. But by mid-autumn white-footed mice have collected caches of food to get them through the winter. Hamilton discovered that they are also fond of storing clover seed and beech seeds, and once found almost a peck of beechnuts they had stashed in a beech tree cavity in New York State. Here in Pennsylvania, some white-footed mice have periods of torpor from late December until early February, but most remain active. They stay warm by nesting with other white-footed mice and/or deer mice huddled in tree cavities or by nesting underground. During all seasons of the year, though, in our home, “they run about the house at night; they nibble things they shouldn’t touch, and no one seems to like them much,” as the poet Fyleman wrote. She may have thought mice were nice, but despite their beguiling appearance, I think they are an attractive nuisance. This marks the 20th anniversary of my column for the Pennsylvania Game News. The first appeared in January 1993 and concerned the Carolina wren. Thanks for reading! Last January I walked along the Black Gum Trail. Since our son, Dave, constructed the trail halfway up Laurel Ridge, back in the 1990s, I had never been able to take the trail in winter. Usually, it was deep in ice and snow as was our north-facing hollow road. But on that mild day there was not a smidgeon of ice or snow on the trail or road. I neither saw nor heard any creature despite the warm day. The long-promised sun was trying to shine through a matrix of puffy, white clouds drifting past patches of blue sky. At dawn it had been 34 degrees and breezy, and the thermometer had been slowly rising all morning. Then, as I descended the trail, I glanced down at my pants and socks and pulled off seven adult black-legged ticks. I could hardly believe it. I had considered winter to be tick-free on our mountain. Usually, they spend their winters buried under leaf litter that should be covered with snow. But they are tough creatures, and as soon as it warms up they are out and about. At that time the adult females are not carrying Lyme disease because they had had their last blood feeding on white-tailed deer. 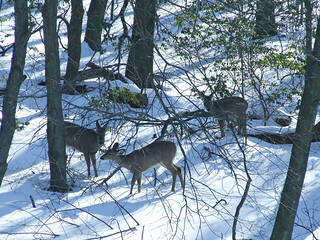 Some even winter on the deer. But, as Dr. Richard S. Ostfeld of the Cary Institute of Ecosystem Studies in Millbrook, New York says, don’t blame deer if you get Lyme disease. The immune system of deer kills the bacteria that cause the disease. After all, like any arachnid to which ticks are closely related, the nymphs and adult ticks have eight black legs. But the larvae only have six. The larvae hatch from the several hundred to a few thousand eggs each female adult tick lays in spring. She then dies. Both the larvae the first summer and the nymphs the second summer feed once on a mammal and prefer white-footed mice, although they will feed on other small mammals or birds if they can’t find a mouse. And it is white-footed mice that are the real culprits. 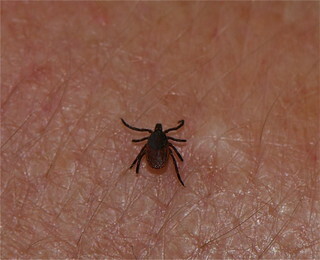 They can get the Lyme disease bacteria and pass it on to the ticks even though the bacteria don’t seem to sicken them. Because nymphs are so small, no larger than a poppy seed, they are liable to bite and never be detected during the three to four days they need to take their blood meal. At least 70% of Lyme disease cases are from those nymphs that do not look like the black and reddish-brown adult female ticks. Instead, they have dark heads and bodies that appear to be translucent. Adult male ticks, which don’t feed but will attach to a host when searching for a female to mate with in the fall, are either black or dark brown. Entomologist Thomas Say named the black-legged tick — Ixodes scapularis — back in 1821. But the first known case of Lyme disease wasn’t identified until 1975 when several children in Lyme, Connecticut were diagnosed with juvenile rheumatoid arthritis. It turned out to be what later was named Lyme disease. In 1982 scientist Willy Burgdorfer isolated the bacterium causing the disease, and it was named in his honor Borrelia burgdorferi. Scientists also thought that a new species of tick carried the disease and named it Ixodes dammini. It was only later in the 1990s that they realized the tick transmitting the disease had been around and named long ago. But they did recognize that the tick belonged to the family Ixodidae, the so-called hard ticks. They have a hardened plate called a scutum on their idiosoma region, which is a specialized part of a tick’s body that expands to hold its blood meal. Like ticks everywhere, the nymphs and adults climb a shrub or blade of grass, hold out their forelimbs, and wait for a victim to brush past. They also lurk on fallen logs, tree trunks, or even on the ground, especially the nymphs which can’t climb as high as the adults. Since they arrived on our mountain, about six years ago, I no longer have the pleasure of sitting on my hot seat on the ground, my back against a tree, watching the life of the forest. They even reach me on our benches unless I pull my feet up on to them. Ticks have a Haller’s organ on each foreleg with spiny indentation packed with sensors and nerves capable of picking up a breath of carbon dioxide, heat, sweat, or even vibrations from your footsteps. So no bird or mammal can escape their sudden lunge. As I’ve discovered, the small huckleberry shrubs on Laurel Ridge Trail and the grasses of First and Far fields, are ideal “questing” posts for ticks, as well as the underbrush in our forest off the trails where I rarely venture anymore. The tick presses its mouthparts into your flesh and saws an opening. Then they lower a barbed tube, called the hypostome, to draw out blood. Because it takes several days to get a full blood meal, it cements itself to your skin with a glue-like material called “attachment cement,” which is why a tick is so difficult to remove. During the first 24 hours it is attached, it is harmless. But later, when it is full, it takes water from your blood into its gut and spits it back into you, which is when it can transmit Lyme disease or two other diseases — babesiosis and anaplasmosis. The parasite Theileria microti causes babesiosis and Anaplasma phagocytophiolum causes anaplasmosis. As many as 2 to 12% of Lyme disease patients will have anaplasmosis and 2 to 40% babesiosis. This complicates the diagnosis and treatment sometimes because the tick might transmit one or the other or both diseases and not Lyme to a patient. In rural New Jersey, for instance, the Center for Disease Control studied 100 black-legged ticks and discovered that 55 of them had at least one of the three pathogens. 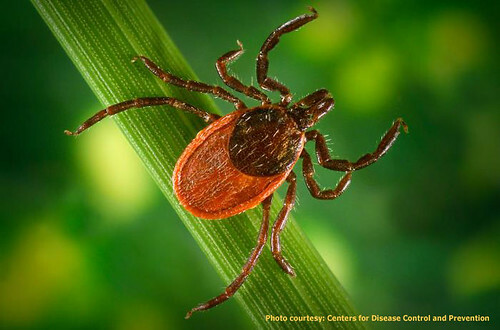 Both babesiosis and anaplasmosis have flu-like symptoms similar to those of Lyme disease but without the telltale bull’s-eye rash. Some folks don’t recognize or even have symptoms of babesiosis, yet they can pass it on to others through donated blood. So far, Pennsylvania seems to be almost free of those two diseases, but they are more prevalent in New York and New Jersey. Unfortunately, it is probably only a matter of time until these diseases increase in the commonwealth. Last year was supposed to be especially high in Lyme disease cases. That was because in 2010 there was a bumper crop of acorns, followed by 2011 when there were practically none. Dr. Ostfeld, forest ecologist Dr. Charles D. Canham, and colleagues at the Cary Institute first worked out the connection between the amount of acorns and the population size of white-footed mice. In abundant acorn years mice numbers soar but they crash when the acorn crop fails. According to Ostfeld, that leaves a large number of infected ticks looking for hosts. Without the mice, they are after us instead. At least one hunter friend of ours contracted Lyme disease last June. Although he did get the rash, he never saw the tick. I suspect it was a nymph that bit him. He also listed four places where he could have picked up the tick — turkey-hunting at our place, at a friend’s country property, and on his own country property, or his backyard at the edge of Altoona. 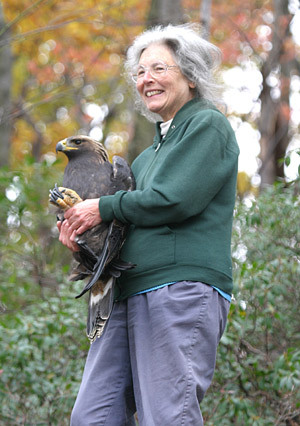 If Ostfeld’s research is right, his backyard was the most likely habitat. In a paper for Conservation Biology Ostfeld and other colleagues entitled “Effect of Forest Fragmentation on Lyme Disease Risk,” they wrote, “Our results suggest that efforts to reduce the risk of Lyme disease should be directed toward decreasing fragmentation of the deciduous forests of the northeastern United States into small patches… The creation of forest fragments of 1-2 hectares should especially be avoided, given that these patches are particularly prone to high densities of white-footed mice, low diversity of vertebrate hosts, and thus higher densities of infected nymphal black-legged ticks.” Given both the size of our forest and the diversity of vertebrate species, we should have less Lyme disease here. 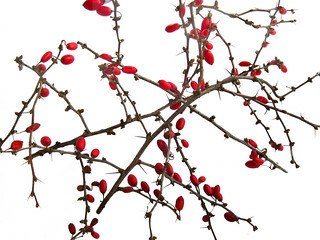 On the other hand, another study by Tom Worthley and other researchers at the University of Connecticut Forest in Storrs claims that eliminating the invasive Japanese barberry shrubs (Berberis thunbergii) will help control the spread of Lyme disease, anaplasmosis, and babesiosis because white-footed mice favor the barberry’s habitat. “When we measure the presence of ticks carrying the Lyme spirochete we find 120 infected ticks where barberry is not contained, 40 ticks per acre where barberry is contained, and only 10 infected ticks where there is no barberry,” Worthley says. Unfortunately, our neighbor’s old 100-acre property that we were able to purchase only after it was poorly logged, is filled with Japanese barberry and other invasives. It’s also moved into the edges of our fields and even into the edge of portions of our older forest. Eliminating all of these bushes will take many manpower hours. But our caretaker hopes to experiment with a few of his own ideas for removing them over the next several years. In the meantime, I’ll continue to follow most of the suggestions for avoiding tick bites, including super vigilance of my clothes and body, even in winter, when I take my daily walks.